Fred Phelps, founder of the Westboro Baptist Church died today at age 84. Baruch Dayan emet. “Baruch Dayan emet” is what Jews say when anyone dies. It means, “Blessed is the True Judge.” It’s appropriate for anyone, saint or sinner or mystery. Watching twitter today, I saw many responses to Mr. Phelps’ death. Some were thoughtful, some were angry, some were clever, but this was one of those times when I’m glad to be an observant Jew. “Baruch Dayan emet,” I said, grateful for the tradition. I have no idea what drove Mr. Phelps and his followers to picket funerals and spew hate. 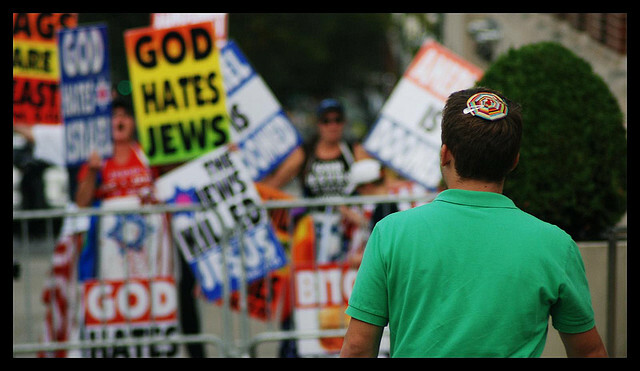 He hated a lot of people, including LGBT people, Jews, and a long list of others. Death is often called “the great equalizer.” Rich or poor, famous or obscure, we all die, and our bodies turn to dust. Fred Phelps is no different in that respect: his body will turn to dust. But what is not equal after death is the memory we leave behind us. Jews are apt to say in comforting a mourner: “May the departed’s memory be for a blessing.” That one won’t be used much for Mr. Phelps, if it is used at all. I don’t know what he was to his family, but he made his life into a curse for many LGBT Americans, and for the people mourning at funerals his church picketed. He has left behind an entire generation of people to whom the name “Fred Phelps” will mean cruelty, hurt and disrespect for the dead. Each of us has some choice over the memories we leave behind us. Choose wisely. Posted on March 20, 2014 March 20, 2014 Categories A California Jew, LGBTQTags hate, LGBT, Phelps, Westboro Baptist Church5 Comments on Goodbye, Mr. Phelps.